Cryogenic System Design Service | Design & Project Management - Meyer Tool & Mfg. ​Our cryogenic system design services are perfect for a wide range of professionals. Engineers, scientists, procurement officers and more have all used our service, and have been pleased with the work we do for them. Anyone who needs a custom-built cryogenic chamber or piping system can benefit from our highly experienced cryogenic manufacturer service. Most of the cryogenic systems we build are for national labs, especially regarding particle accelerator work. However, we can and have worked with many types of clients in a broad range of industries. Let us design your next custom cryogenic system! 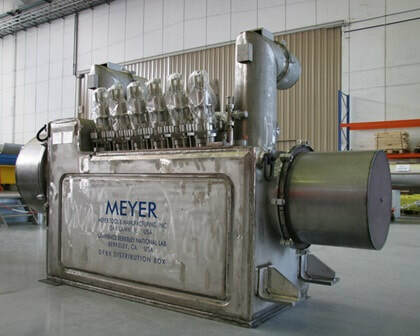 ​At Meyer Tool & Mfg., we are recognized experts in cryogenic engineering. Our cryogenic design services are like our custom pressure vessel and vacuum chamber design services. A cryogenic system be comprised of any number of the following components including an outer vacuum shell, MLI vacuum insulation, ASME B31.1 piping, heat exchangers, heat shields, and internal pressure vessels. We do both large and small jobs. For example, a small cryogenic piping project might be no more than a 6-inch long piece of insulated tubing or, sometimes, jacketed tubing. An example of a larger job might be a vacuum chamber with insulation and cutting-edge technology inside, as large as 40 feet long by 10 feet in diameter. Basically, a custom cryogenic system can be anything you want it to be. Give us your unique requirements and we will build it for you. There is no job in cryogenic fabrication too unusual for us to build. Our engineers are used to getting custom requests that are like no other. Contact us and discuss the scope, purpose and preferred design of your project, and we can tell you how we will make it happen for you. Our cryogenic fabrication team has successfully worked with everyone from oil and gas companies transporting natural gas, aerospace companies such as NASA, universities and scientific labs of all types across the country. There is no job we cannot do, and that is our guarantee to you. ​When working with us, you will receive a dedicated engineering resource expert for your project. We will explain every aspect of the project to you as we go over your unique requirements, including what cryogenic machined components we will be using on your design. We will put a manufacturing plan together, order all the necessary materials, and arrange and manage the schedule for the project. Your dedicated engineering resource expert will be your single point of contact to ensure that all your project needs are met. ​If you’d like to take the next step, call to discuss your proposed project. We are excited at the prospect of working with you on creating your unique design. You will find our prices to be the most competitive in the industry, and our engineers to be the most skilled. You will also find our ability to bring custom designs to life to be unmatched. Contact us today.